London is full of interdimensional portals. In the words of Bill Hicks, “Who’d have thunk it?” I didn’t know such portals through space and time existed. Let alone in London. But it was on the Internet to it has to be true. 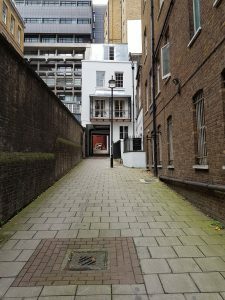 There’s a website called Portals of London which does a great job of collecting their locations. 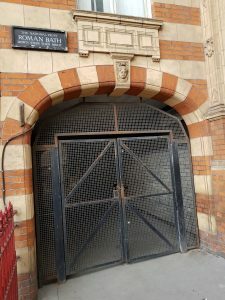 While I’ve not had chance to visit the bit of South-East London where the Blackheath Vanishments took place or the Time Tunnel Tumbler (better known as the Woolwich Foot Tunnel anomaly), one portal is only a stone’s throw away from Charing Cross, the station I use when I venture into London. The legend goes that there’s an old Roman baths in the basement of a property now watched over by the National Trust on King’s College land that once allowed its bathers to either travel through time or into other dimensions. 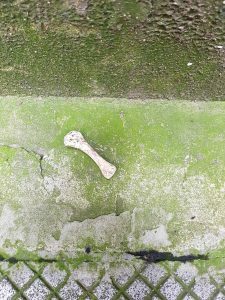 According to one unnamed Roman writer (according to the Portals of London site) a quick soak in the pool’s waters led him to “a land untouched by man, hot beneath a white sun, strange birds in the sky above”. Now both interdimensional and time travel have both been on my “To Do” list since watching Mr. Ben as a three year old. 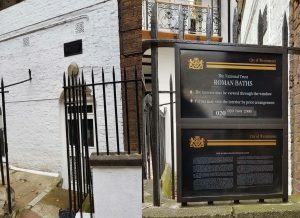 When I’d shared the article from the Portals of London website on Facebook a colleague had tried to find the Roman bath’s top secret hidden location and been UNABLE TO FIND IT! Proof that it was mystical. Or that it was late and the gates were locked. You decide. Last Thursday afternoon I set off to locate the Quaerium (as the Roman legends called the gateway, and no, I don’t know what that word means either). It was an epic quest and one I hoped would result in a quick bit of interdimensional time travel. The journey took me into the heart of London. I started at Charing Cross Station and took a right down the Strand. The bath is supposedly off Surrey Street according to some sources (not far from Temple tube station) – there’s even a sign on the wall in Surrey Street saying as much – but this is just clever misdirection, probably on the part of whichever time-travelling Roman first built the mystical baths. Arundel House. Aka Mys-Tech’s old base. My way to interdimensional travel seemingly barred, I nearly turned back. Mysterious men were everywhere digging up buildings. I suspected they were part of some top-secret organisation looking for more gateways. 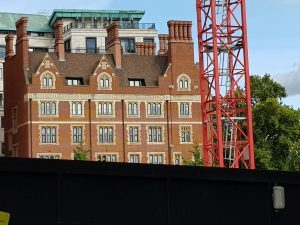 Or possibly building more luxury apartments to dwarf Marvel UK’s old offices in Arundel House. I’d worked at Marvel UK for years in the 1990s, little suspecting a gateway to other worlds lay so close. Although there was a strange kind of time warp in the nearby Cheshire Cheese pub where I’d often only gone in for five minutes and left to find hours had passed in the outside world and the time travel had left me disorientated and in need of a kebab. Strand Lane. Gateway to the Portal. Casting my mind back to my drunken 1990s escapades (and aided by google maps) I remembered there was another way into the would-be time machine. Down the bottom of Surrey Street, take a right and you’ll come to Strand Lane. My path was guarded by another mysterious figure who told me I wasn’t allowed to enter without a pass. King’s College blocked the Strand entrance few years back – probably to protect their new-found portal. After a quick trip back to King’s College reception, I asked for a pass to visit the Roman baths (resisting the urge to ask for a pass to the transdimensional gateway) and returned. This time I was allowed access to Strand Lane. I was getting closer. I tried to take a photo of the guard but his image wouldn’t appear on film (or I might have forgot to take one). But it doesn’t matter. I was there. Nearly. Strand Lane is one of those strange little London streets where you feel transported back in time even without the use of time portals. They’re usually quiet, with the backs of old buildings looming up around you and the imagined ghosts of old Londoners walking by. About two-thirds of the way up the lane I found it. Hidden in the cellar of an old white building ­– the Quaerium! (Possibly. Portologists seem to believe there was one in Roman London but not sure where). The building containing the baths is rarely open to the public – probably to protect the space/time continuum – but you can see it through the window. It has to be said to my highly untrained eye it does appear a little like a Roman baths. I looked at it for some time but didn’t find myself dragged into another world. Which, to be honest, was a bit of let down. I suspect for the gateway to truly work you’d have to lie in the actual waters and, as the waters looked a little dirty, I think I’d give that a miss even if I was offered the chance. Also I’d probably only end up in prehistoric times and get eaten by a T-Rex, which, to be honest, I could do without. The bone from a small T-Rex. Oddly enough a photo I took of the bath/portal through the window had a mysterious haze on the picture. Now some would say this was just a combination of the rain and some dirt on the glass but I like to keep an open mind on these things and pretty sure it was caused by some kind of quantum flux emanating from the depths of the mysteriously grey waters of the Quaerium. And don’t forget top by my books Zombie 18 and Punch Drunk Kisses.